UNICOIL offers an innovative service to our valued customers and end users. Six standard colors for the Molawan products can be supplied within a short delivery lead time with a very low minimum quantity. 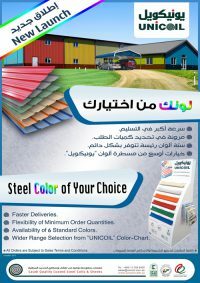 UNICOIL is the only company that can quickly supply its customers such a wide range of steel colors combined with flexible order quantities. Constant availability of the six standard colors (as listed below). Shortest delivery lead time of 7 business days. Minimum quantity of 5 metric tons per color (with a total truck capacity of 25 metric tons). Nominal thickness of 15 microns on the top or weather side. The finish coat is available in six standard colors. Interactively choose from the six standard colors below. Colors viewed on this website may vary from the actual product color due to limitations of computer monitors. Ask for a physical sample to ensure that your color requirements are fulfilled. Able to supply most colors from the UNICOIL RAL Color Chart when requested by a customer (refer to the UNICOIL RAL picker below). Precise color matching to any specific color that is not in the RAL Color Chart within 3 working days. Minimum quantity of 25 metric tons per color. Normal delivery lead time is within 4 weeks for other colors. Other colors conforming to the RAL Color Chart or other international color charts can also be supplied. In case of doubt, send a sample chip for color matching.